This strange creature just happened to be crawling around our garden. I couldn’t figure out what it is except that it’s a caterpillar. To be honest I don’t know anything about their kind to make an informed genealogical guess. It did have sharp teeth though (more like two fangs) on another photo taken from the front. I picked up my elder daughter from school and when we came home it was crawling on the side of the driveway. So I ran inside and brought out my camera and then gently relocated it under some thickets lest one of the many hungry birds in our trees mistook it for lunch. I guess it must have crawled away since I didn’t see it after that. Note the red bulbs on its spikes. Doesn’t look very friendly. 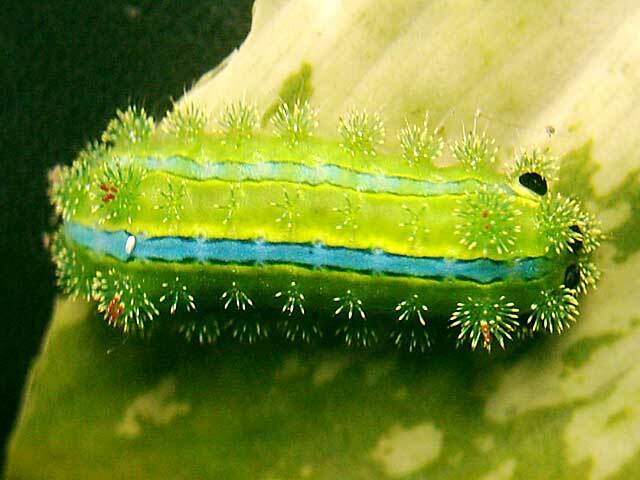 I had assumed caterpillars to be gentle passive creatures as their appearance suggests. But once I saw the spikes and the fangs, I have changed my mind. Nothing docile about this type except maybe its size which was around an inch long. I wonder what kind of butterfly it will eventually metamorphosize (is there such a word?) into. I don’t usually paste photos on this blog (this may actually be the first) mainly because they don’t turn out well enough to share but I think I will start posting more from now. Some of them really are worth a thousand words – each.